Swami Aseshananda (1899 - 1996) was immersed in the great Monastic Tradition of the Ramakrishna Order. He was initiated by Sri Sarada Devi, knew direct disciples of Sri Ramakrishna, and served as Swami Saradananda's personal secretary/attendant. After serving in Varanasi, Madras, New York, Boston, and Southern California, Swami Aseshananda was appointed the swami-in-charge of the Vedanta Society of Portland, Oregon. Remembering Sri Sarada Devi's Disciple: Swami Aseshananda As We Knew Him bears testimony to the life-transforming power of an exemplary teacher through the words of the monks, nuns, disciples, and devotees who knew him. Swami Aseshananda's message is compelling and universal. The accompanying CD includes a broadcast video interview with Swami Aseshananda, historic photographs, The Lotus and the Flame: Monastic Teachings of Swami Aseshananda, letters, and other archival material. “Swami told me that he too, as a college student, had been influenced by Western thinkers like Kant, Hegel, and Russell. However, his apprenticeship under Swami Saradananda changed many of his early assumptions about the nature of reality and experience. From Saradanandaji, he had learnt the value of service and how it transforms character. His final blessing in the form of Holy Mother’s initiation had taken care of all the dissenting and dissonant voices within him; it made him fully prepared to be a dedicated monk to the Ramakrishna Order.” —Dr. Sreemati Mukherjee, Reader in the Department of English at Basanti Devi College, Kolkata. “When all is said and done, one thing remains: the absolute authority that informed Swami Aseshananda’s dictum to transcend our limited state and realize our true nature. This wasn’t a mere recommendation—no—you sensed he’d achieved this realization and spoke as a knower of Brahman. 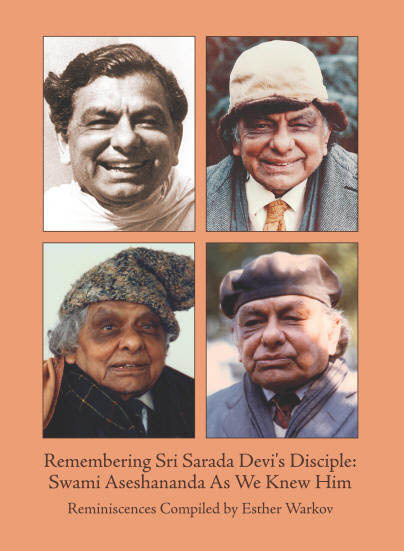 That Swami never sought adulation for his personal achievement made him all the more inspiring.” —Esther Warkov, Ph.D. The author of this compilation earned a Master’s degree in musicology and a Ph.D. in ethnomusicology. Her publications include articles on music, recordings, music reviews, and articles for American Vedantist and the Sri Sarada Society. American Vedantist Spring-Summer 2010: "Esther Warkov has rendered a signal service to the Ramakrishna Vedanta community, not only in America but worldwide, by assembling more than 60 remembrances of one of the great swamis of the swamis. . . .what it gives us is a living sense of the Swami as he touched and transformed the lives of those who came to him. In their immediacy and variety, these reminiscences provide a rounded, multi-textured portrait of the swami; in their remarkable candor and directness, they bring us a genuine, living person, not an edited, air-brushed saint . . . . His life was a remarkable blend of jnana, bhakti and karma-yoga. His public teaching was largely on Advaita Vedanta, and he encouraged aspirants inclined towards non-dualism to follow that path. At the same time, his devotion to Sarada Devi, his teacher, and to Sri Ramakrishna, was intense and profoundly moving. . . . Remembering Sri Sarada Devi's Disciple is attractively produced, with good quality paper and large enough print to avoid eyestrain. . . . a large number of photographs are given on the accompanying compact disc. Also included on the disk are facsimiles of the swami's handwritten letters, two video segments of the swami being interviewed. . . . I strongly recommend this book for its vivid presentation of a modern saint who lived and taught among us for many valuable years." "Esther Warkov's book is the best thing to come out of the RK Vedanta literature in decades!!"